25 Mm D-Ring Clip, Ca=rdboard+PVC outside. 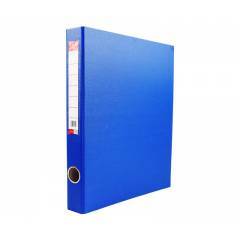 Strong and rigid paper board Ring Binder for binding bulky sheets.. Extra large size for comfortable use of separators and sheet protectors..
High quality D-ring binding mechanism with paper stopper, allowing papers to sit perfectly straight..
PVC cover on top for more durability and longer life..
Saya Blue Ring Binder PVC Cover A4, Dimensions: 263 x 36 x 314 mm (Pack of 2) is a premium quality Clip Files from Saya. Moglix is a well-known ecommerce platform for qualitative range of Clip Files. All Saya Blue Ring Binder PVC Cover A4, Dimensions: 263 x 36 x 314 mm (Pack of 2) are manufactured by using quality assured material and advanced techniques, which make them up to the standard in this highly challenging field. The materials utilized to manufacture Saya Blue Ring Binder PVC Cover A4, Dimensions: 263 x 36 x 314 mm (Pack of 2), are sourced from the most reliable and official Clip Files vendors, chosen after performing detailed market surveys. Thus, Saya products are widely acknowledged in the market for their high quality. We are dedicatedly involved in providing an excellent quality array of Saya Clip Files.